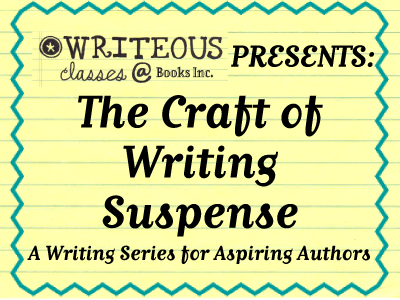 Books Inc. and Writeous Writers present the third installment in their Craft Series for Aspiring Authors with four authors in conversation discussing tips and tricks on Writing Suspense. Joining us for this special event are New York Times-bestselling writer Amy Stewart, author of Miss Kopp Just Won't Quit: Kopp Sisters Novel #4; Ellison Cooper, Former murder investigator for the Washington DC Public Defenders Service and author of the dazzling debut thriller, Caged; National Black Ribbon Award-winner John Burley, author of The Quiet Child; and Nick Taylor, San Jose State Associate Professor of English and author of Double Switch: Johnny Adcock #2 under the pseudonym T.T. Monday. This event is free and open to the public.